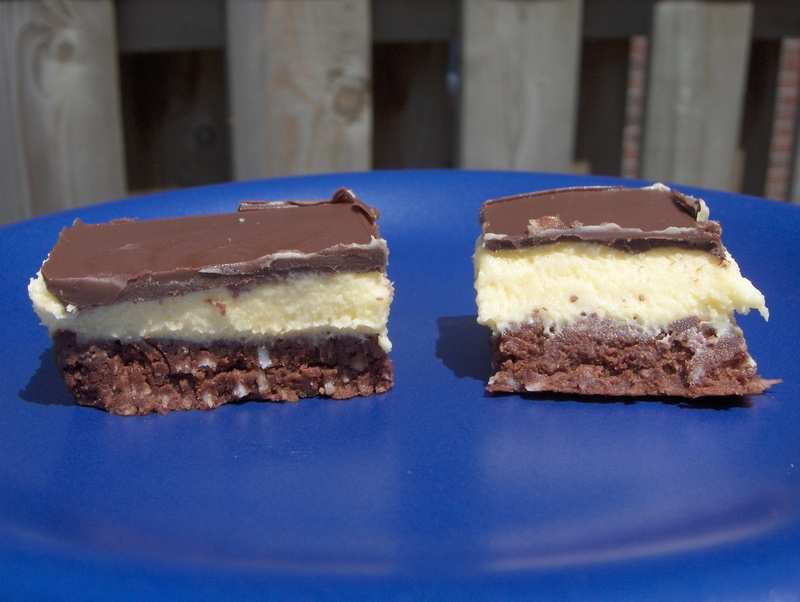 Nanaimo Bars originated in the Nanaimo, British Colombia area in the 1950’s. A woman named Mabel Jenkins submitted the recipe to a fundraising cookbook and the bars became very popular in the area. I had never heard of them until I was researching my cupcake alphabet, but they sounded interesting: a bottom crust of chocolate, coconut and nuts, topped with a vanilla custard and covered with a chocolate layer. My friend Millie is Canadian was nice enough to bring me one (several) back from a visit home. They were delicious! 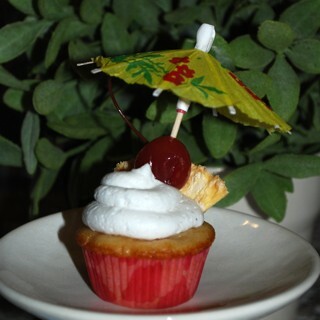 In creating my Nanaimo Cupcake, I used the recipe found on the city of Nanaimo’s website. My original plan was to use the bottom layer of the bar as the bottom of the cupcake, add a cake layer, then fill the cake with custard and top it with melted chocolate. Of course, I had an issue or two…. 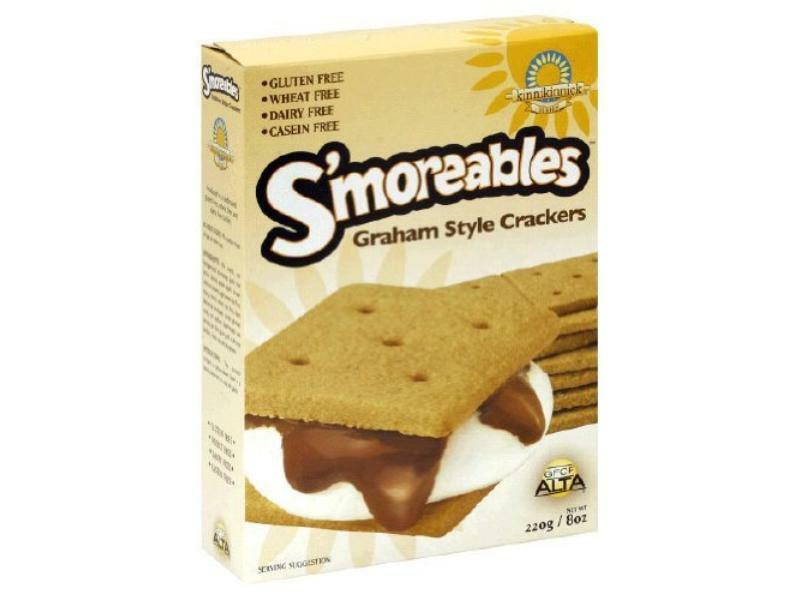 Since I’m currently (and hopefully not indefinitely) on a gluten free diet, I used Kinnikinnick Gluten Free Smoreables Graham Style Crackers. I tried a couple straight out of the box and was not overly pleased. They were extremely sweet and had a slightly gummy texture. The original recipe instructed to melt the butter with the cocoa and sugar in a double boiler then add the eggs and cook until thickened. I didn’t want to overcook the crust since the bars aren’t baked, so I just combined everything, then plopped it into the cupcake papers. I am not a gluten free baker and have been unsuccessful making a consistently good gluten filled vanilla cake, so I cheated on the cake layer. I added 3 eggs, 1/2 cup oil and 1/2 cup water to the mix and stirred then used a scoop to put it into the cupcake pans on top of the chocolate/coconut mixture. I ended up with 2 pans of cupcakes (24 total) which I baked according to the directions on the bag (325 degrees for around 20 minutes). Cream butter, cream, custard powder, and icing sugar together well. Beat until light. I had to make a couple of substitutions. First, I had no idea where to obtain custard powder. After googling, I discovered that I could substitute Instant pudding mix. Second, I forgot to get cream when I was at the grocery store. All I had in the house was rice milk. I was hoping that it wouldn’t matter so much since the recipe called for only about 3 tablespoonfuls. I combined everything together and ended up with an extremely grainy mixture. I tried adding more rice milk and the mixture started looking curdled. ARGH. I wavered back and forth for a few minutes about returning to the grocery store for cream. I thought about just going out for milk and using the rest of the pudding mix to use instead of the custard layer. It was already 7:30pm and I only had 2 hours left before bedtime. I attempted to make instant pudding with rice milk. I didn’t think it would work and I was right! The pudding didn’t thicken. I decided the vanilla custard layer would be represented with the cake layer. While the cupcakes cooled, I melted some chocolate chips with a little butter. 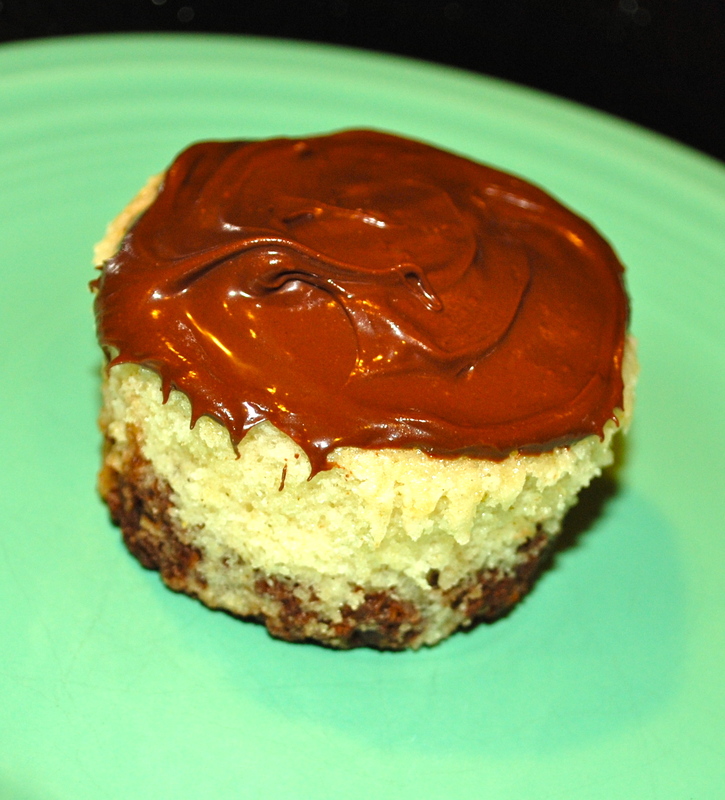 I topped the cupcakes with the melted chocolate and hoped for the best! Overall, I think people enjoyed them. I was pretty happy with them. 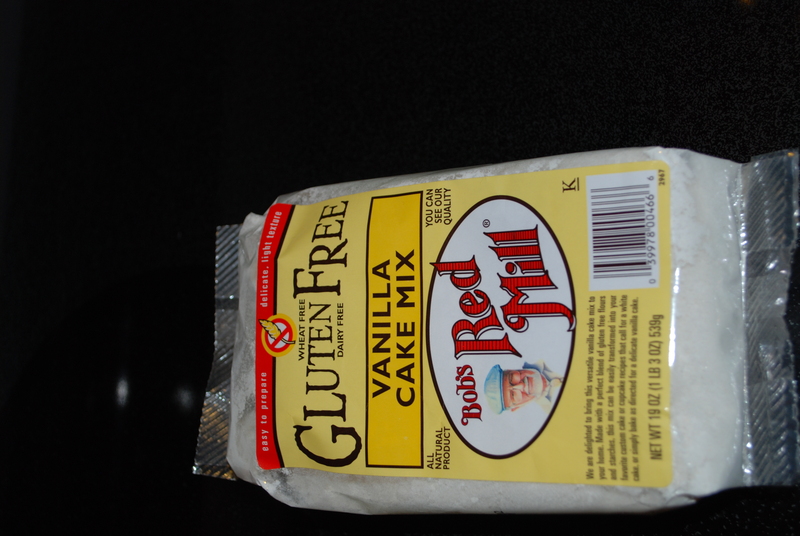 I thought the vanilla cake layer was good and had a pleasant texture. Mr Shuck liked them as well. The Nanaimo bar cupcake was yummy. Thanks, Mrs. Shuck! I know I would’ve liked it with vanilla custard in the middle too. The only custard powder I know of is Birds Custard, which I’ve seen at some Safeways. Well the flavors were good. I love being one of your cupcake tasting minions. Gluten free was okay. I think it’s over though. I have introduced wheat products again with no ill effects so far.